After the Beetroot Carpaccio, I was thinking about trying a more traditional recipe. 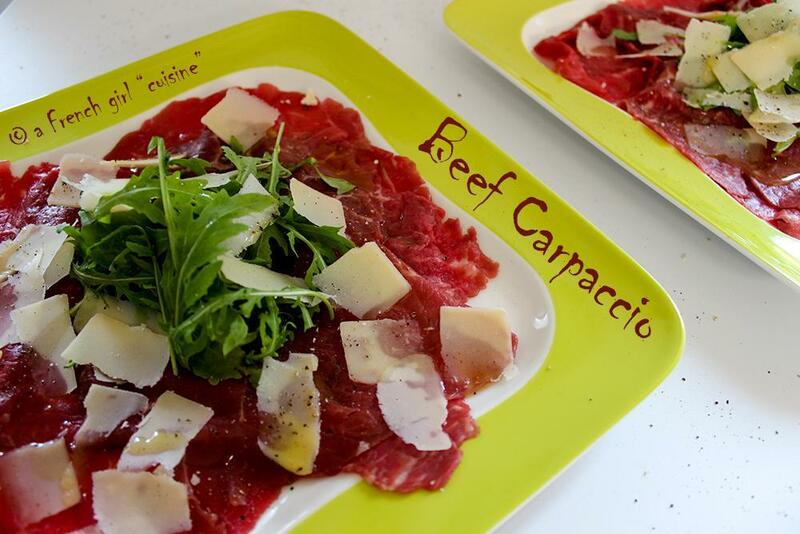 Do you like beef carpaccio? I am not really a fan but my boyfriend loves it and I hope that you will like it too! 200 to 300 gr. of beef filet – I ask my butcher to slice thinly the meet already. Place the meat slice in between two greaseproof sheets and flat the meat with a rolling pin. Place in your plates. Shave the parmesan cheese and add some rocket and sliced lemon on top. Then spread some olive oil, pepper and salt as you like. If you feel like that you can also add some fried pine nuts. I’ve never tried this before but I love the simple preparation. They say “never say never” but honestly, I could never eat raw beef. Of course, us Irish tend to overcook beef, which isn`t the best thing. Have to say, I just LOVE your presentation, your styling and your photography. It`s just superb-extremely professional. How did you get your logo and the recipe name on the plates? That`s just super cool. Maybe not a carpaccio but you could like tartare! Recipe coming in few days! Thank you very much :). Just learning by doing. The name…. Computer….